In December, Rory and I visited Iceland for the first time and went aurora hunting on our own (with a rental car and mobile phone data as guides). As a scientist, I am knowledgeable about the data, but less of a serious aurora hunter than many of you. I don’t even have a digital SLR camera. Regardless, I wanted to share a few highlights of my experience there. Overall, we caught a little bit of aurora on each night, nothing too spectacular but satisfying nonetheless. The weather changed every 5 minutes and clear skies were a big challenge. The official Iceland cloud/aurora forecast is helpful. I could see how Aurorasaurus users in Iceland have a lot of time to verify tweets while waiting for the weather to clear. With more locals tweeting when they see the lights, it would help the tourists and Aurorasaurus. Dark skies were also a challenge, but the aurora cooperated for us by starting to show relatively early each day (just a coincidence I think). But it was so early that I didn’t believe the Aurorasaurus alert the first time! Night 1: We were at Grótta Lighthouse on the outskirts of Reykjavík. Great viewpoint, but very windy and very very cold, so we discovered that you can take some pictures even inside the car. I examined the local ancillary data sources for aurora hunters in Iceland, which are pretty sparse. There are two real-time all-sky cameras I saw, but one has a bonus pair in Antarctica. There is also a useful magnetometer is here, but you need to be able to read magnetometer data to know how to use this. Here is a good resource on learning how to read magnetometer data. As an aside, Iceland is a special spot as it is one of the few land masses magnetically connected to land in Antarctica. There have been a few exciting simultaneous northern and southern hemisphere auroral studies have been done from here… on more of an irregular field campaign basis. Hopefully in the future, this will be set up more routinely. Night 2: We still didn’t get out early enough, scouted for other locations and found some neat possibilities, but missed a timely early tweet. Generally, the activity was significantly pre-midnight. We made other friends on Twitter who were actively tweeting about nearby auroras. Unfortunately, the best auroral display we could see was just a few green pixels on the camera. Night 3: We went out again in a relatively dark Reykjavík neighborhood and were in the proper location to see the beginnings of a small storm, before more clouds obscured the rest of the storm. We got out of the car and the aurora was clearly moving overhead. To the naked eye, the aurora had bright greens, a hint of pink, and had very fast motions. When the aurora really brightens significantly, it can definitely be seen from most of downtown Reykjavík. Of course darker areas are still better. This aurora happened early and we were done by 10:30 pm to catch up on sleep. Night 4: Thanks to Iceland Air and a missed connection, we had a bonus 24 hours in Reykjavík. We had no car, but we did have our cold weather gear (specifically traction devices because there is a lot of ice to walk on). We went for a nice aurora hunting stroll down by the University. No aurora was seen until the end of the walk. Overall, Iceland was amazing, and spectacular fun even in the darkest part of winter. There are amazing Christmas and New Year’s traditions. The flight, hotel, and car were reasonable in price. Iceland has all the chocolate covered liquorice you can eat (tip: the airport has the lowest taxes of anywhere). I would love to go back and make more connections with the locals and the STEAM (Science, Technology, Engineering, Art, and Mathematics) communities. Must haves include a tripod, flashlights, wind pants, a balaclava, birch flavored schnapps (try Birkir and Bjork), and lots of warm layers! What was your aurora hunting experience like in Iceland or other areas? Write to us (aurorasaurus.info@gmail.com) and you could be featured on our blog! 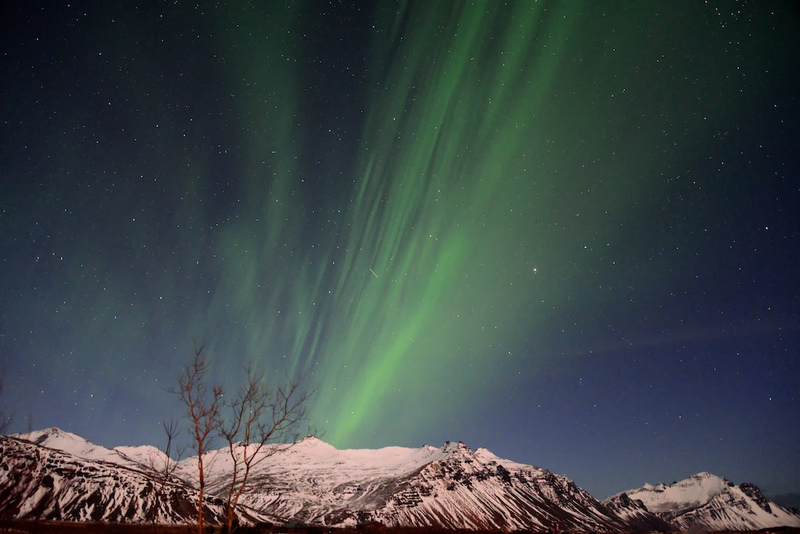 Thanks to traveler Nick Smerker for sharing his aurora experience in Iceland with us! Liz MacDonald is the founder of Aurorasaurus and a space weather scientist at NASA’s Goddard Space Flight Center in Greenbelt, Maryland. This entry was posted in Chasing the Aurora: First-hand accounts from our users, Uncategorized. Bookmark the permalink.